Published in the series Sociology of Crime, Law and Deviance, Volume 5. Scroll down for a pdf copy. This volume focuses on the ways in which (sociological) criminologists study terrorism and counter-terrorism. Generally, terrorism has not been central in criminology, but since September 11, terrorism has suddenly and resolutely moved center stage in criminological debates. Conferences, lectures, funding opportunities, and publications now all fully embrace terrorism and counter-terrorism as topics worthy of serious reflection and investigation among criminologists. The papers in this volume bring out the distinct contribution criminologists and criminological sociologists have to offer in the study of (counter-)terrorism from theoretical, methodological, and substantive viewpoints. The discussions include a usefully broad variety of themes, including conceptual and theoretical perspectives in the criminology of terrorism; hate crimes and terrorism; civil liberties and the control of terrorism; terrorism, war and crime; state crime and terrorism; terrorism and transnational crime; the police dimensions of counter-terrorism; terrorism and the (international) court; terrorism and punishment, and other issues. The specific criminological orientation of the book makes this volume stand out among others. Bringing together distinguished scholars to present these various themes, the volume hopes to bring a comprehensive and insightful state-of-the-art overview of terrorism and counter-terrorism as themes of criminological reflection. Published as Volume 5 in the series, Sociology of Crime, Law, and Deviance. HOW DOES STUDYING TERRORISM COMPARE TO STUDYING CRIME? NEOCONSERVATIVISM AND AMERICAN COUNTER-TERRORISM: ENDARKENED POLICY? Law & Politics Book Review - The fifth volume in a series, entitled “Sociology of Crime, Law and Deviance,” this work is the child of September 11, 2001. The book showcases the contribution of criminological sociologists to the study and understanding of terrorism and counter-terrorism. Policing - This beautifully written collection of essays examines terrorism and counter-terrorism from several perspectives: theoretical; methodological; counter-terrorism and security; and the construction and reality of terrorism. Beginning to address the questions of what terrorism is, and how it can be addressed—or not—the book provides a useful and highly readable overview for practitioners and theoreticians alike. A complete PDF copy of this book is freely available online! See also the 2015 volume Terrorism and Counterterrorism Today. 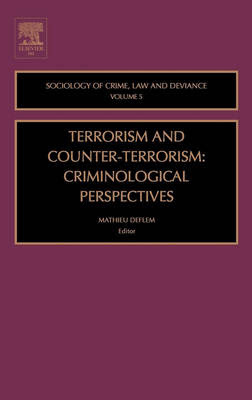 See other edited books by Mathieu Deflem and related writings on terrorism.